I had to post this just really quickly as I thought it was too cute to keep to myself! We had Maya groomed today (we do this every 2-3 months). 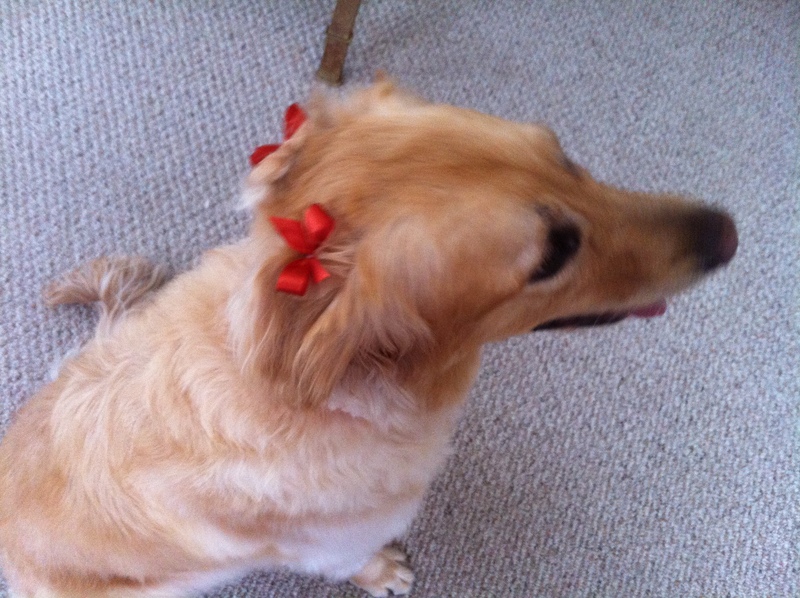 When I picked her up she looked just adorable in her Thanksgiving/harvest bows. They are orange with a golden brown material underneath. The orange sticks out but the brown blends into her fur. Regardless, I had to share the photo. Being a energized golden retriever, she wouldn’t sit still for a nice photo, but you can at least get a glimpse of how cute she is. Today I am thankful for the skilled groomer that we take our little baby to. I am not good at keeping her looking good, but the groomer spends a lot of time and love on her to make her look beautiful, feel better (by taking out the mats of fur), and smell great!